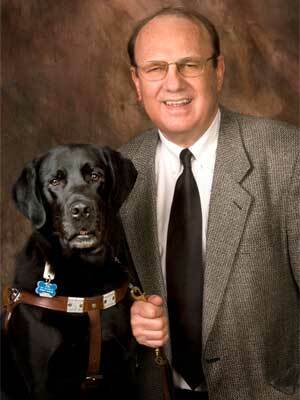 The ranks of the visually impaired are expected to rise dramatically in the United States during the next few decades. According to a 2008 Centers for Disease Control study, some 3.4 million Americans are either legally blind or visually impaired. The National Eye Institute projects that by 2030 that number will more than double, to 7.1 million people, and climb to more than 13 million by 2050. The reasons for the jump include higher survival rates of premature infants who never develop complete vision, a growing diabetes epidemic, returning veterans who have suffered vision-impairing injuries and millions upon millions of aging baby boomers. As varied and complex as these causes are, one thing is clear: The increasing number of visually impaired people will only heighten the demand for highly educated vision specialists in a market that even now struggles to fill jobs. That favorable job outlook is not lost on Tamera Tillman, who attends NIU’s Visual Disabilities Program. Housed within NIU’s College of Education, the program is known nationally for its expert faculty, rigorous curricula and its highly sought-after alumni. NIU’s Visual Disabilities Program began in 1964 as a special education program for blind and visually impaired children. An orientation and mobility component was added in 1972, and rehabilitation for blinded adults began in 1978. It is housed in Graham Hall, named for the first state director of special education. training rehabilitation teachers to work with adults who have visual disabilities. 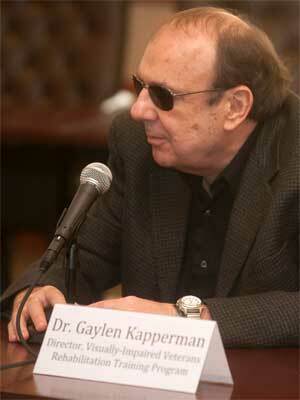 Professor Gaylen Kapperman, who has been a driving force behind the program since 1974, lends a unique perspective to his students due to his own blindness. He channels a lifetime of experience facing challenges and prejudice to prepare his students for careers in the field. He is often the first person prospective students meet with to determine whether the career is right for them. Many of his students say his personal experience with visual impairment and blindness infuses passion into their learning, and makes for the caliber of program that attracted them to NIU from across the country.